The Heart of Hearing Program scrapbook. 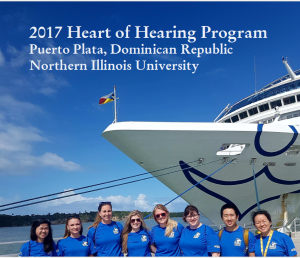 Several NIU audiology students, along with audiology professor King Chung, visited the Dominican Republic on a humanitarian trip through the Heart of Hearing Program. On their visit in January, they identified patients who might need surgery, cerumen services (ear wax removal), and/or hearing aids/cochlear implants. When they returned to the Dominican Republic in March, they conducted cerumen management, and referred the potential surgery patients to an ENT surgeon in a private hospital, Centro Medico Bournigal. Heart of Hearing Research and Humanitarian program offers students opportunities to travel to different countries/governing regions to provide hearing health services. Its goals include humanitarian services, research studies, academic and professional exchanges, and student training. View a scrapbook of both trips here.